Just putting out some suggestions I been thinking on, I probably will forget with time so better post it. I think these kind of changes could be put into patches individually as small balancing changes, giving enough time to evaluate the impact of the change before introducing more changes - this way you would only have to worry about 1 change at a time rather than 20 different changes at the same moment working against each other. Add option on vendor to enable or disable polearm knockback <- this is important for both mage and physical, the weapon right now is unusable for physicals because people just jump kite making polearm one of those weapons that can never finish a melee fight (you either lose melee or the enemy jump away on the knockback). Mages would still prefer the knockback though so option is necessary. Improve secondary effects that were shafted by the balance patches, Pungent mist at 100, intensify 100, end game staff and the spell was still not effective - the thresholds for some spells are ridiculously high and need adjusting, very disappointing for people who invested a lot of time for a certain build to find it completely ineffective. Bone Armour already has enough physical protection. 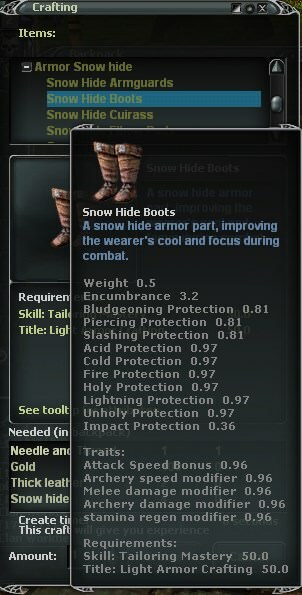 If I understood OP's suggestion, he's not asking for higher physical prots on Bone armor, he's asking for reduction of magical traits and addition of some physical traits - to make it into a hybrid armor. Looking at it again I think you are right, it isn't overly clear though. -> Q5 feather base value? 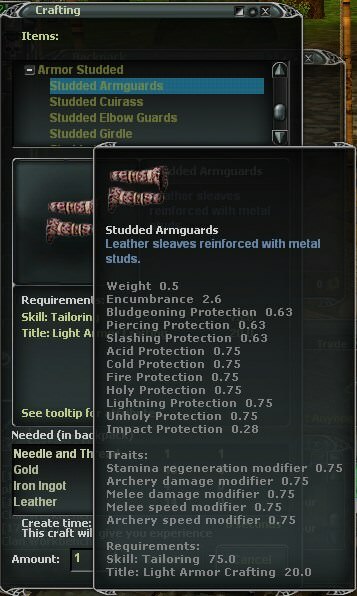 I'd just like something a bit less of a headache to work with, I don't want to make each gear bag based on whether I get lucky / unlucky with the feather. What doesn't really make too much sense is the scaling encumberance on the armor tiers, the 2nd tier with snowhide practically forces a Q5, when would you ever justify Q5 on snowhide. Can't back you up on that one Aedryn. Hybridation come from mix matching armors and it's more flexible so. I don't really see them addressing it for a long time but the current build options you have is Q3 or Q4 thick / giant, and Q5 exarch / deinos. You could go through a lot more effort to make something in between but at that point you might as well be committing to q5 exarch deinos anyway. 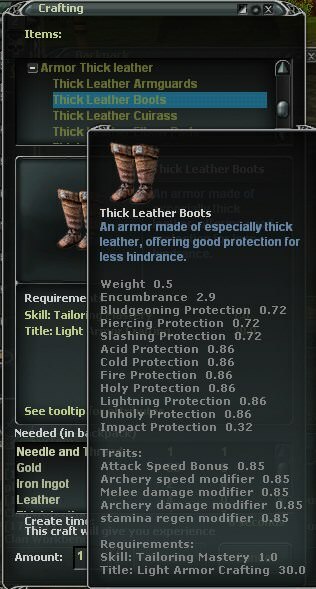 wrong values in crafting window. When crafted they all have same encu. That's interesting, will have to check that. I'm not really married to any of my ideas, it's more like a brainstorm of different things and some of these might be pointless in hindsight while others worth considering. Like I will never play full heavy again, unless there's battlespike bhop.